If you create a blog under one email account and suddenly get the idea, like I did, to match your blog’s email with your book’s name, just because it seems consistent and cool – Don’t! That is, don’t change your email address on a blog you’ve created until you’ve EXPORTED your old blog. 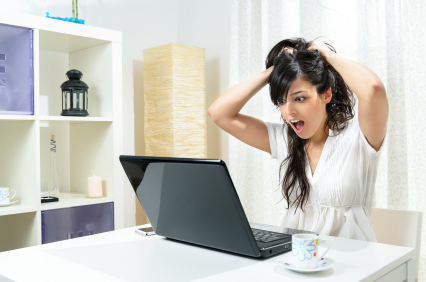 While Blogger does save your blog for a short time after you delete the email address connected to it, the may not be there by the time you remember to change to the new email address. I thought I’d change the email of my blog, “Publishing Lucky” to a new email I created to be more similar to my book’s, “Lucky, the Left-Pawed Puppy”. It seemed as if the only way to do that was to delete the old email address, so I did. By the time I remembered to add the NEW email address: leftpawedpuppy@gmail.com, my blog had disappeared. So here I am trying to duplicate the same polka dot background (please tell me why!) while starting all over from square one. And all of that brings me to my favorite quote paraphrased from despair.com, and the main reason I write at all: ‘Maybe the sole purpose of my life is to serve as a warning to others.’ So “Welcome”; don’t fool around with changing emails or deleting your blogs accidentally, and let’s start our journey together.